Please welcome back guest writer John Passmore to discuss some great tips for note taking in law school! 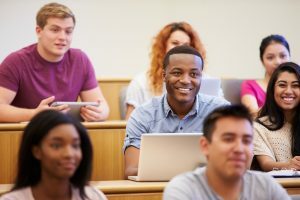 Law school demands your presence in class in two senses—showing up physically and showing up mentally. Good note taking reflects both. A key benefit of being physically present is capturing in your notes the things you can only catch by being there. Most law school classes are professor-driven and dynamic. Most professors will tell you what you need to know implicitly (or sometimes explicitly) during class. By keeping your ears open and keeping track of when a professor emphasizes a point or stresses that a certain case is critical, your notes will be course and professor specific, which is invaluable. Being in tune with you professor is worth more than a stack of canned outlines or supplements. Note taking can also help you be mentally present. In undergrad, showing up and passively receiving a lecture was enough to get by. But law school requires active listening. Trying to write down as much as possible is not a winning formula. The law is complicated and most law school classes that follow any sort of Socratic method approach force you to synthesize the material on the fly. Just typing what is said, assuming you can type fast enough, will look like gibberish when you go to review it. You need to be listening and translating your understanding of concepts and discussions into your notes. Note taking based on active listening will help you stay engaged and be truly present. Many law school students fear the cold call more than just about anything other than the bar exam. Well-structured and concise notes can help in this department. Notes can be a great help to give you confidence during a cold call. Whether it is a case recitation or a rule-based hypothetical, your notes can spark your memory if they are designed to meet this need. As for case-driven cold calls, you can prepare a structure for your in-class notes before you even get to class. As you read before class, take some quick case notes which will provide you with a structure for your class notes. This will keep you organized in class and give you a head start so you can focus on the material and not on getting case names down. You can easily add class discussion notes on each case below your concise pre-class notes. As for hypotheticals, if your professor likes to ask for the recitation of rules, elements, or concepts from the current class or a previous one, keep these key concepts in your main notes document. If the class conversation turns back to a tort discussed the day before, a quick search of your note document can take you to a neat list of elements. Keep your notes as concise and readable as possible so you can always have a cheat sheet of the course in your notes to refer back to during class. If your notes synthesize the material, they will be a valuable tool to get you through class. You also want your notes to be helpful in your outlining process and exam prep. It is a mistake to craft a course outline or study materials from anything other than your class notes. The professor that is behind those notes is writing the exam, so you don’t want to have to ditch your class notes when you need them the most. The exam can seem a long way off at the beginning of the semester, but from day one take notes with the exam in mind. If you are listening actively, you will know what is important. Make a consistent, bold signal in your notes to remind you months later that you want something in your head for the exam. My high priority notes were usually annotated with this — ***KNOW FOR EXAM***. Make your notes work harder for you. If you are tempted to daydream or go shop online, think about how valuable your note taking can be if you put in the effort. You will get more out of class, be prepared for cold calls, and be ready to outline. And if those reasons aren’t enough, just remember how much you are paying per credit hour. Even if you fancy yourself a great note taker, scrutinize your note taking this semester and reap the benefits! John Passmore is an assistant managing legal editor in Houston, Texas. He received his B.A. from Texas A&M University and his J.D. from The Catholic University of America, Columbus School of Law.